French magazine YAM (Chef Yannick Alleno) - Culinary Techninque, June 2013. Text by Leslie Gogois / Photography by Fatina Faye. We are only just starting to hear about cryoconcentration. However, this totally natural technique is not a new thing. Bruno Goussault published an article on the subject back in 1971. He carried out trials on lemon juice and kefir and culinary innovation was on the move. We discover this process with its inventor in person. 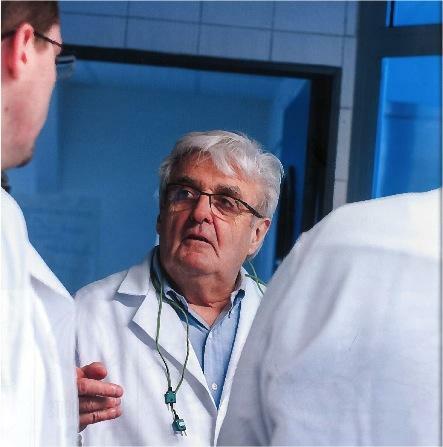 This unstoppable and intriguing biochemist has been scientific director of the CREA (Centre de Recherche et d’Etudes pour l’Alimentation) center for the research and study of food since 1991 which he founded with the support of Joël Robuchon and Henri Gault. He never ceases to remind us that “well applied science can produce wonders in cuisine.” Here is the proof. YAM: Is this a recent invention? Bruno Goussault: No, cryoconcentration has been around for a long time in the desalination of sea water. It is also used in preparation for the freeze-drying of fruit juices and coffee. Because the energy required for freeze-drying is very costly, an upstream stage is required – cryoconcentration – to concentrate flavors and produce juices with over 40% dry material content. YAM: Could you describe cryoconcentration in a few words? B. G.: It’s the same process that produces ice wine. When grapes are frozen and then pressed, a more concentrated juice is obtained because the water, in ice form, remains with the grape pulp. To put it simply, we separate pure ice from the extracted juice. YAM: How did you adapt cryoconcentration to gastronomy? B.G. : By using simple, commercially available appliances. I started by making chunks of frozen juice with an ice-cream maker that I had modified. I needed big chunks of frozen juice, like you’d get if you were making ice-cream with a faulty machine. I put the chunks into the bowl of a juice extractor and put the whole thing into the freezer for twenty to thirty minutes until the chunks swelled. Then all I had to do was extract the concentrated juice by spinning the chunks in the juice extractor. YAM: You’ve worked on this technique with Joël Robuchon, I believe. B. G.: Yes, he was the first to use this process around seven or eight years ago. What he wanted at the time was to produce a highly concentrated tomato juice. Because the pulp stayed in the ice the resulting concentration was really exciting. Then I worked with Régis Marcon to produce mushroom juices from which we had extracted all the water. For several months I’ve been continuing my research with Yannick Alléno. YAM: It’s possible to concentrate flavors by making a reduction. What’s so much better about cryoconcentration? B. G.: There are three ways of concentrating flavors in cooking: by reduction, using evaporation at high temperature, using evaporation at low temperatures under slight pressure, and by cryoconcentration. When making a reduction, the product must be heated and therefore part of the flavor evaporates with the steam and reduces the original flavor. Using a rotating evaporator, such as – the Rotovator – used notably by Ferran Adria, you can concentrate at a lower temperature using vacuum techniques. The product suffers less damage. However, with cryoconcentration the product is not damaged at all. We make chunks of frozen juice and then remove the ice to leave nothing but the concentrated juice. YAM: So is this is a long way from molecular cuisine? B. G.: Yes, because this technique is totally natural. In molecular cuisine chemicals are added to the juice to make foams, emulsions, and to thicken it. As a disciple of Joël Robuchon, I’m against cooking with a medicine chest. YAM: You often say every product contains a hidden extra that we need to learn to use. What do you mean by that? B. G.: Every product has its own functional properties. For example, egg yolk contains natural lecithin that helps to create an emulsion. Egg white has foamability. The interesting thing about cryoconcentration is that we can concentrate the egg yolk and egg white to increase their functional properties. YAM: You’ve also carried out trials on skim milk. Tell us about that. B. G.: When using cold to concentrate skim milk, the caseinates are concentrated to produce a creamy emulsion. It’s a little like cream but without the fat that goes with it. YAM: Does it work with any ingredient? B. G.: Yes, as long as it’s liquid and can be pressed. Take meat for example, you can use the exudates from cooking, that is to say the meat juices, and re-concentrate them. Alternatively you can press the raw meat. There are no limits to cryoconcentration, we need to try everything. This text as been translated from a French article. Please find attached the original.